The Town of Nantucket Energy Office was established in July 2011 to provide guidance and assistance for island-wide energy projects and initiatives, as approved by the Town Manager and Board of Selectmen. Consider us your island energy resource. Have questions? Contact or visit us today. 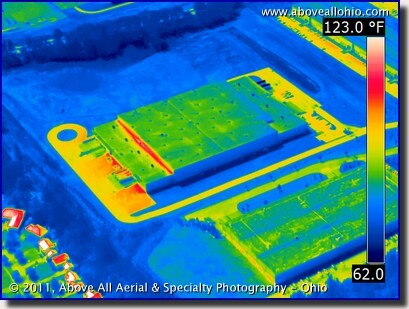 Free Energy Code Seminars: January 9th & 10th! Recycle your fridge or freezer, get $75! Do you have an old refrigerator or freezer that’s collecting dust and wasting energy? Mass Save is offering $75 to local customers who recycle their old, outdated, and inefficient refrigerators or freezers. Schedule your FREE appliance pick-up by calling 1-877-889-4761 or online at: www.masssave.com/recycle. ​Visit website for full eligibility requirements, space is limited. ​Offers Cleaner, Smarter Heating & Cooling! ​A new, clean energy program called HeatSmart Nantucket has launched in Nantucket! HeatSmart Nantucket is the latest energy initiative led by the Town of Nantucket Energy Office, with support from local volunteers, to encourage local residents to transition from inefficient electric, oil and propane-based systems to high efficiency, solar hot water and air-source (“minisplit”) heat pumps. Through the HeatSmart Nantucket program, islanders will have the opportunity to learn more about these high-efficiency heating and cooling systems; take advantage of thousands of dollars in state and utility incentives, access 0% financing, and work with a qualified installer offering special, limited-time pricing to HeatSmart program participants. For more information, visit www.heatsmartnantucket.org, or contact Lauren Sinatra, Energy Coordinator, lsinatra@nantucket-ma.gov; 508-325-5379. ​The Dept. of the Interior recently announced a Proposed Sale Notice for two unleased wind areas, 15-25 miles south of Nantucket, with a 60-day public comment period. Of note is a 5% credit for developers who execute a "Community Benefits Agreement" with an impacted community. The Town of Nantucket continues to meet with interested bidders to discuss ideas for local community benefits. ​Nantucket, MA. Electric customers enrolled in the Town’s municipal electric aggregation program, Nantucket PowerChoice,will soon see a decrease in their electric rates. Starting with May 2018 meter readings, the Nantucket PowerChoice electric rate will change from 9.13 cents to 9.05 cents per kWh Residential participants enrolled in Nantucket PowerChoice will save 17% compared with National Grid’s proposed 2018 summer rate of 10.87 cents per kWh. Commercial and industrial participants will enjoy savings as well, as will PowerChoice Green participants. "Are you Solar Ready? 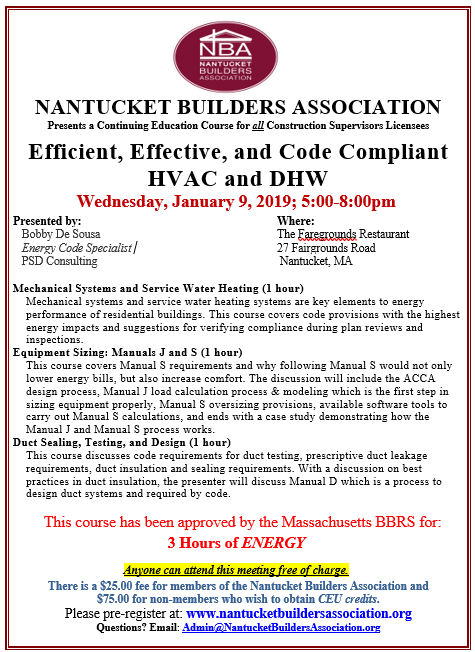 And Other Energy Code Updates"
This classroom training will help code officials, builders, contractors, architects, and engineers stay up to date with the most significant energy code changes in 9th Edition of the Massachusetts State Building Code (780 CMR), including requirements for rooftop solar readiness related documentation. These requirements went into effect with a concurrency period on October 20, 2017 with a concurrency period through January 1, 2018 when the 9th Edition went into full effect. The program will also cover several changes that came with the implementation of the 2015 International Energy Conservation Code (IECC) in January 2017. The first part of the presentation will provide an overview of the 2015 IECC, a Massachusetts energy code adoption timeline, and connect the dots between the IECC and Massachusetts Amendments. This section also discusses new solar-ready provisions. Nantucket is one of seven Massachusetts communities selected by the state to participate in a pilot program to put "cleaner," less expensive home-heating and cooling systems in more homes, the Executive Office of Energy and Environmental Affairs announced earlier this week. Nantucket residents can take advantage of the program by purchasing heating and cooling systems from HeatSmart, which purchases the equipment at a bulk discount rate. The savings are passed on to the consumer. The program seeks to encourage more people to put cleaner, more efficient heating systems into their homes by making the equipment more affordable.The anticipated outcome is two pronged: reducing the state's carbon footprint by switching to more efficient home heating and cooling methods and saving people money on their bills. In Nantucket, residents will have an opportunity to purchase air-sourced heat pumps or solar hot water systems. The HeatSmart pilot communities also receive funds to promote awareness of alternative heating and cooling technology and education. Sign-ups for program participation will begin in February 2018. Contact the Energy Office at 508-325-5379 for further information in the meantime. "Baker-Polito Administration Announces Seven Communities to Participate in Residential Clean Heating and Cooling Programs." Press Release (2017. November 15). 1/8/17-- National Grid announced this week that its project for a 48 megawatt-hour battery energy storage system on the island of Nantucket has been greenlit and Tesla has been selected to provide the batteries. Nantucket has been experiencing significant growth and demand for electricity, both of which are expected to continue for the foreseeable future. 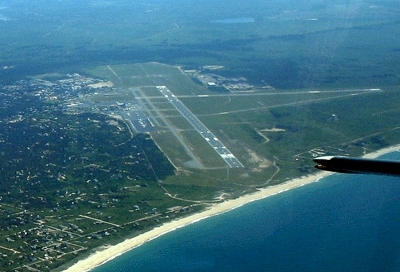 The island’s electricity is supplied via two submarine cables that connect with the mainland transmission system on Cape Cod. In the event of a failure on one of the cables, two six-megawatt diesel generators are available to provide partial back-up power. The diesel generators are reaching the end of their useful life and need to be replaced. Additionally, given the growth forecast, the island’s emergency electricity back-up system needs to be expanded, and a third submarine cable likely will be needed in about 12 years. National Grid explored several options to address these infrastructure needs and the ever-increasing on-island demand for electricity, and came up with a unique solution: the BESS and a new diesel generator that together can supply the island in the event of a cable failure. National Grid expects that with the BESS, the need for a third cable can be delayed for 15 to 20 years beyond the current 12-year forecast. The BESS will be six megawatts with an eight-hour duration, which is also described as a 48 megawatt-hour system, and is being provided by Tesla. "The Town of Nantucket commends National Grid’s decision to deploy an innovative energy storage solution on the island," said Town of Nantucket Energy Coordinator Lauren Sinatra. "We are confident that the proposed project, combined with targeted energy-saving programs and other planned electric infrastructure upgrades, will play a transformational role in meeting Nantucket’s near- and long-term energy needs." Town of Nantucket launches solar rebate program for local residents! (June 20, 2017) Beginning this July, the Town of Nantucket will launch a local solar rebate program intended to stimulate the adoption of solar energy systems on primary, residential properties located on Nantucket. Rebates of up to $2,500 will be provided to cover a portion of the costs of successfully-installed solar photovoltaic (PV) systems, making ownership more affordable for local residents. Increased renewable energy generation will help to “green” the local electric supply and reduce summer peak load and costly capacity charges, resulting in lower electric supply and distribution costs for Nantucket electric ratepayers, and specifically those participating in Nantucket PowerChoice—a municipal electric aggregation program launched in March 2017. The Solar Rebate Program will be funded through an extra 1/10th cent per kilowatt hour (kWh) that will be included in the Nantucket PowerChoice supply rate. 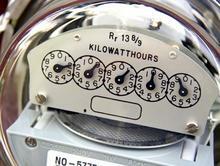 As of July meter reads, aggregation participants will see a rate increase from 9.03 cents/kWh to 9.13 cents/kWh. The new rate remains less than National Grid’s current basic service rate of 9.432/kW and equates to an 80 cent-per-month increase for an average resident using 800kWh. The rebates are available on a first come, first served basis as funds are available. Learn more here! June 14, 2017 – The Baker-Polito Administration today announced the awarding of a $1.5 Million grant to help reduce Nantucket’s peak energy demand with an innovative energy storage project. The Massachusetts Department of Energy Resources (DOER) awarded Genbright and Ice Energy a contract to provide over 200 of Ice Energy’s proprietary Ice Bear 20 energy storage systems to Nantucket residents at little to no cost. Beginning this summer, the Ice Bear 20s will be installed to deliver over 1 megawatt (MW) of peak demand reduction, which is equivalent to one year of electricity demand load growth on Nantucket. The winning proposal was supported by the Town of Nantucket’s Energy Office and endorsed by the Nantucket Board of Selectmen.... Click to read full press release. 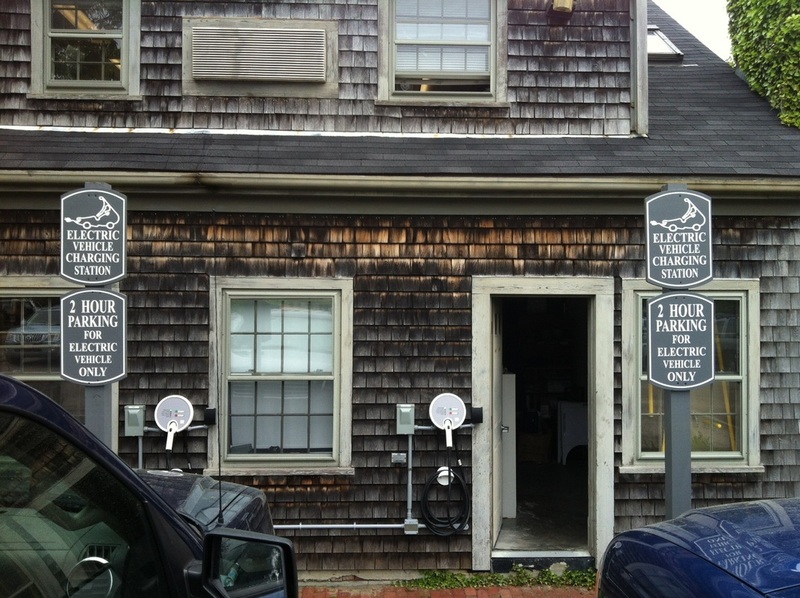 The Town of Nantucket is pleased to introduce Nantucket PowerChoice! Approved at the 2016 Annual Town Meeting, Municipal Electricity Aggregation is a form of group purchasing in which a municipality competitively procures electricity supply on behalf of its citizens. Growing in popularity as an alternative to volatile electricity pricing, aggregation is designed to deliver: Competitive pricing, cost savings, rate stability, customer protections, contract transparency, greener energy and expanded choices. The Town launched the program in March 2017, learn more here! Hear Lauren Sinatra and George Aronson of the Town of Nantucket Energy Office discuss local energy challenges in Jason Graziadei's NPR piece "Keeping Nantucket Powered is a Challenge as Electricity Demand Rises"
Ryan, Connor "Ice Energy, Genbright to deploy 1MW if ice energy storage in Nantucket." 20 June 2017. Clemente, Elizabeth "Town gets grant to provide innovative air conditioners." The Inquirer & Mirror. 6 July 2017. SOLAR Rebate Program: Clemente, Elizabeth "Solar energy rebates available​." Inquirer & Mirror. 6 July 2017. 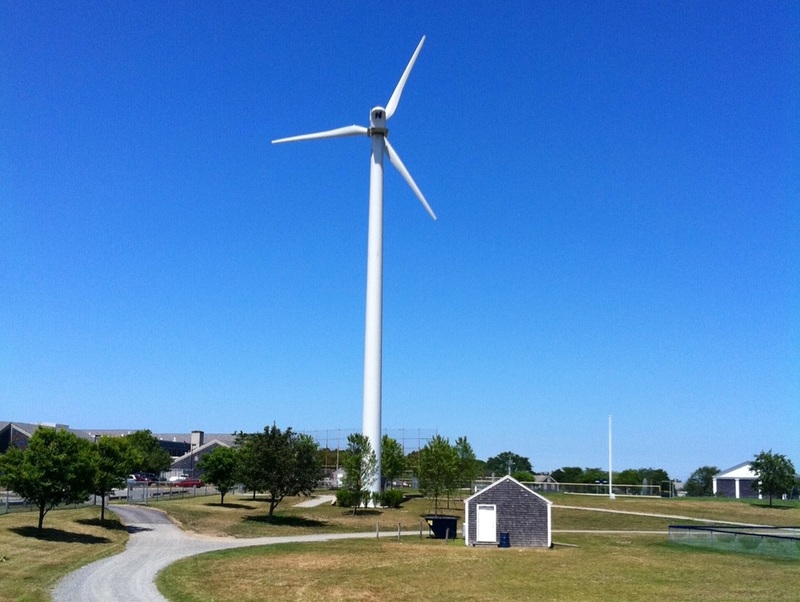 Offshore Wind: Cucuzzo, Rob "Leading the Charge: Can Nantucket Become 100% Self-Sufficient?" N Magazine. Stroll ﻿2015 Edition. ﻿﻿Solar PV: ﻿Turer, Matt "Town Interested in Abandoned Airport Solar Project." The Inquirer & Mirror. 25 November ﻿2015. ﻿Deferring the Need for 3rd Undersea Cable: ﻿Turer, Matt "﻿National Grid Exploring Need for Third Cable﻿." The Inquirer & Mirror. 6 August 2015. "Town switching electricity supplier for all rate payers." The Inquirer & Mirror. 6 March 2017. Sutters, Peter "Aggregation Could Lower Islanders' Electric Bills." The Inquirer & Mirror. 21 April 2016. ﻿Turer, Matt "﻿Aggregation May Lower Electric Rates﻿." The Inquirer & Mirror. 30 July 2015. Electricity Prices: ﻿Turer, Matt "Opportunity to Lower Long Term Electric Rates." The Inquirer & Mirror. 14 January 2016. 7/10/17-Nantucket Planning Board approves permit modification to allow National Grid to upgrade two aging back-up generators with a new 12MW generator at the company's Bunker Road facility. Click to read I&M article about the project. October 30-December 17, 2016: WPI From October 24 until mid-December, the Energy Office will sponsor and serve as the main project advisor to four undergraduate engineering students from Worcester Polytechnic Institute, on the topic of: “Electric Vehicles: Analyzing the Benefits and Complications of Increased Adoption”. This project will be the sixth research project that the Energy Office has sponsored in recent years, focusing on local energy issues. Summer 2018: A new record level peak load occurred on Sunday, August 14, 2016 at 6:00pm, reaching 48MW (up from previous peak load of 44MW on August 4, 2015). National Grid is analyzing the summer weather to determine the severity of the heat wave as compared to historic weather patterns. Preliminary indications point to an extreme or near-extreme summer weather pattern. April 13- May 6, 2016: Nantucket Power Choice Draft Aggregation Plan open for public comment. Learn more here. April 2, 2016: Voters unanimously vote to approve all articles related to renewable energy (Articles 90-92) and municipal electric aggregation (104) at 2016 Annual Town Meeting. Click to read more about this year's articles. Effective January 1, 2016 National Grid will decrease and fix the Cable Facility surcharge rates through 2026 in order "to both minimize the over-recovery of the Combined Cable Facilities revenue requirement in 2016 and to provide rate stability in passing back the over-recovery to customers over time.” The company estimates that an average Nantucket resident will experience a 5.2% decrease of $7.52 in the summer and a 3.2% decrease of $4.44 in the winter. Commercial accounts will also see substantial savings. More information can be found here: Click Link!